TAKE ADVANTAGE OF ALL OF THESE LOCAL OPPORTUNITIES! Hey hey New England... This summer "Speed Camp" --- your team's will NOT want to miss out!!!! James Speed and LeRoy McCullough together -- ONE MASSIVE CAMP!! The two Titans of cheer in one venue for three days! There is no better!!! The 3 of us have designed A COMPLETELY UNIQUE camp format to better assist us here in New England with the skills needed for our scoresheets! New exciting over-night options, and a originally formatted camp (think choose your own adventure! ), with 2 of the biggest dogs in the business - James Speed and LeRoy McCullough! It's like Clark Kent and Superman ... people! You never see these giants in the same place, at the same time!!! LIMITED SPACE! Sign up early!! YOU DO NOT WANT TO MISS OUT! 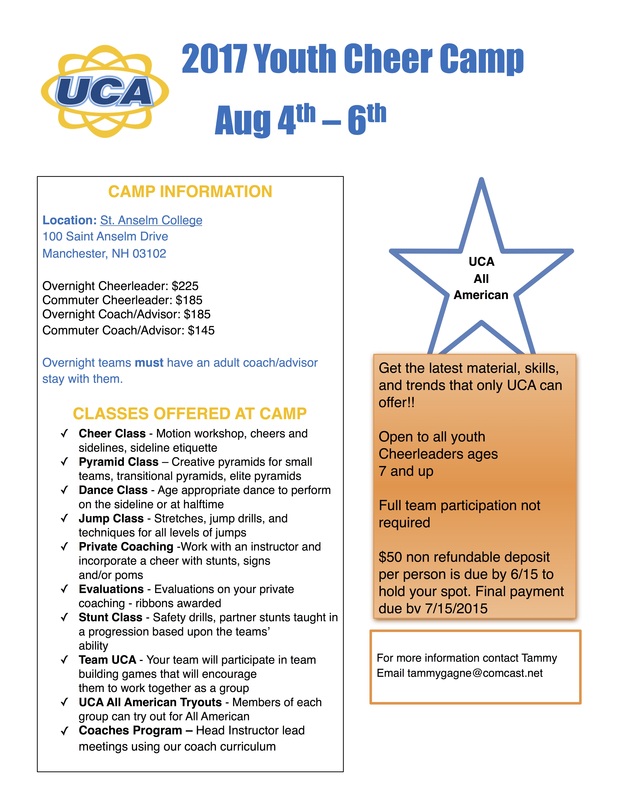 NHYFSC is again offering the UCA Youth Cheer Camp this year from August 4th- August 6th. This cam pis a positive experience for coaches and athletes and you don't want to miss out! The camp works best with entire teams and/or mulitple stunt groups attending together. You don't want to miss out! Meals start with lunch on Friday and end with breakfast on Sunday. Commuters receive lunch and dinner but not breakfast. Any program wishing to settle in on Thursday can do that this year. The cost would be an additional $40 and includes breakfast on Friday AM, $30 without breakfast. Overnight space for the weekend is limited to 300, and I'm already on my way to filling those spots so don't hesitate to send me your numbers so I can reserve your space, no payment at this time. Please email Kalin Hamilton at if you are planning on attending. I know that coaches have already communicated this information on their cheer pages but we need to have a definititve number to attend.